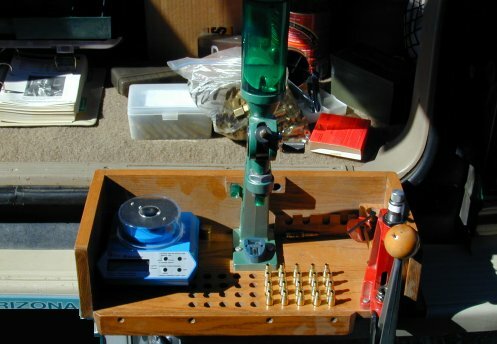 Hand loaders often start loading for handguns then graduate to rifle reloading. A common mistake made during this transition is a belief there are standard rifle loads like they have seen for handguns that will work for their rifle. When loading for handguns; function and reliability is the primary issue. At normal pistol ranges most loads will shoot better than a typical hand gunner can hold. This is not the case when loading for rifles. Each rifle will most probably prefer its own "optimal" load recipe and the difference in what each rifle prefers is quickly evident at the relatively short range of 100 yards. Another shooter's recommended load will only get you in the ball park and is rarely the best load achievable for a particular firearm. Stock bedding, barrel wear, tension on action screws and even the size and shape of the shooter can change the "Ultimate Recipe". When someone recommends their "pet load", the most important information is the bullet, primer and powder that worked for them. The amount of powder will nearly always need to be adjusted. Even then, you may find a better combination of components for your rifle. Indeed, reloading for rifles is often a never ending search for the best load. The time invested in this search is usually determined by the shooter's patience and the load's intended use, or simply what is "good enough". There is no doubt the "20/80 rule" applies; where the last 20 percent of optimal accuracy that can be achieved may take 80 percent of one's time, money and effort. There only a few shortcuts to finding the optimum load for a rifle and all shortcuts involve using proper instrumentation so you know what is going on. When working up a load for a new firearm or caliber you can often learn more and avoid compounded problems by starting with components that introduce the fewest variables. Note: If the rifle has a custom barrel with short throat or is chambered for a special caliber designed to shoot long boat tail bullets you may not have as many options. In this situation the bottom of a flat-based tangent ogive bullet may extend below the neck into the main case body. This can cause excessive neck tension issues if "doughnuts" form at the base of the neck and over pressure. The 6 Dasher is one such caliber and will typically perform best with boat-tail bullets that seat close to the lands with the main cylindrical body of the bullet well above the neck base. Start with a bullet weight the cartridge was originally designed to shoot. Light bullets may produce high velocity but often introduce other problems and make "finicky" calibers worse....especially if loaded with powder that is too slow for the bullet weight! Ball powders are more convenient to use because they meter well through a powder measure. Unfortunately ball powders can behave less predictably. Tubular/extruded powders may out perform ball powders of similar burn rate because they are often less sensitive to termperature variation and should provide better load density in "over bore" cartridges (of which there are many). A friend who worked at one of the powder companies once told me, "If consistency of performance where the only issue in powder design, ball powders would not exist. Ball powders exist because they are less expensive to manufacture and make it easier to produce production ammo with consistent charges." The quality of components and degree of care in loading will always affect group size but using a standard weight flat based tangent ogive bullet and the best "stick" powder recommended for the caliber that produces good load density will limit initial problems and provide a good idea of the firearm's potential. Then through further experimentation, changing just one factor at a time, you can learn if the firearm also shoots other bullet weights/shapes and powders, prefers a particular primer, crimp, seating depth, etc. Shooters have long understood each barrel seems to prefer a certain velocity range. Some reloaders simply call this the "Sweet Spot". We cannot overemphasize the necessity of using a chronograph for load development. If you are serious about reloading you are simply nuts not to own a chronograph. Even a bad chronograph is better than no chronograph and will pay for itself in one season if used correctly. Chronographs are sold with manuals that describe how to get velocity numbers but they do not adequately explain what to do with the data. This information should help. Before good electronic chronographs were available reloaders had to blindly hunt for recipes that worked. Once a good load was found, changing any component could render the whole recipe useless and force the reloader to start from scratch. A chronograph provides direct insight into what your loads are actually doing. You will be able to immediately determine if a different component produces velocity outside of the range your barrel seems to prefer. Lets start from scratch and assume nothing is known about a particular firearm or the cartridge it shoots. The only information we have is from load manuals. Also, time is valuable, we don't have a range in our back yard and must travel to where we can shoot. Begin with the powder recommended by a good reloading manual and your chosen bullet weight. Prepare and prime at least 100 pieces of brass for reloading. The brand of bullets and primers is not important at this point but a standard primer and common flat based tangent ogive bullet is preferred. Consult a good load manual. We will try to find a "sweet spot" in the top 1/3 of the caliber's expected velocity range. Set your powder measure so it throws charges that will produce velocities at roughly two thirds of the maximum indicated for the powder. Determine how much adjustment on the powder measure will throw about 2/10's grains greater charge (often about 1/4 turn). Also note the maximum velocity indicated in your load manual so you have a good idea of when you are approaching the maximum safe load. Use your preferred method to set your seating die so the bullet will be nearly touching the lands. Head for the range with plenty of primed cases, bullets, powder measure, (a scale if you don't trust your powder measure), single stage press and seating die. All you will be doing is throwing powder charges and seating bullets during this phase of load development. One of the projects described on the small projects page is this box to the left. A real handy item for loading at the range. Load 3 to 5 starting rounds and take your best shots through the chronograph (we assume you have good bench technique). Increase the charge a few tenths of a grain and shoot 3 to 5 more. If you shoot a good group, record the velocity and deviation and load 3 to 5 more to confirm the results. Before changing the powder measure after a good group load a sample round so you can verify the charge weight and seating depth later. Continue this process until you see signs of high pressure or reach maximum velocity indicated in your load manual. As velocities increase you should see obvious changes in group size. It should be readily apparent when you reach a velocity the barrel likes;... but don't stop at the first point where you get a tight group. Most rifles have two or more "sweet spots". As you pass through each one, groups will open up again until you approach the next. Stop only when you are at the maximum powder charge recommended in a reputable load manual, your desired velocity, or maximum pressure. Once there, you should have identified several "sweet spots". It's now time to go home for some serious loading at the bench. Optional Method: For those with good rifles, components and bench technique another method may be used. It is possible to complete this part of load development while firing only a single shot of each charge. As you fire, carefully draw a scale duplicate of the target with the velocity and charge next to each bullet hole. Once you complete the entire velocity range (stop at signs of excessive pressure) you may see shots grouped together in an obvious pattern. Loads that impacted in closest proximity should represent a "sweet spot". Any flyers caused by poor quality components or shooter error can render the entire test invalid. Only try this if you are confident in the quality of your components, rifle and shooting ability. At this point you are ready to fine tune the load and should have a rough idea of the velocity your rifle likes but have not yet shot "serious" hand loads. Carefully measure the seating depth and powder charges in the loads you brought home from the range. Load at least 5 more proof rounds of each using your best reloading technique and more over and under the powder charge that worked well. Return to the range with your loaded rounds to validate what the earlier test produced and if possible also determine the maximum and minimum velocity (width) of each sweet spot. This is important when working up loads you hope will perform adequately at different times of the year. Seasonal temperature changes will alter a powder's burn rate and velocity so it will not produce the desired velocity. Loads that work in 100 degree heat usually perform poorly in the winter months. Conversely loads identified in winter months often produce velocities that are too high in the summer. That's usually why you hear this statement at the range, "Gosh, this load worked great the last time I shot it, what happened?" Chances are the last time he shot the load it was a different temperature and on this particular day it shot over or under the desired velocity. By identifying the full range of each sweet spot you may be able to find a load that works well all season long. Of course it will depend on the components you selected and your barrel. You certainly do not want to simply use the first load that worked, or like the guy above, you will be wondering what happened the next time you go to the range... after you loaded lots of ammo that does not work! Because load manuals are typically organized according to bullet weight, beginning reloaders often believe a particular powder charge will perform the same under any bullet of the same weight. This could not be further from the truth. Bullets of the same weight but different shape can produce signficiantly different velocities with the same powder charge. Differences in jacket thickness, shape, base radius and hardness of core material will all alter velocities. Indeed, changing ANY component will change the velocity of a load. This is why a chronograph is the minimum instrumentation required for serious rifle reloading. Once you determine a load's velocity is outside the target velocity range for a given bullet, the load can usually be improved by simply adjusting the powder charge. Further experimentation with component selection, seating depth and/or crimp MAY produce still greater accuracy. This is due to small changes to the load's pressure curve and timing. For information about pressure curves and timing, review our tech article about barrel harmonics. While it is not always true loads low velocity deviation produce the smallest groups at close range (100 yards); the best long range loads nearly always produce low velocity deviation. Few rifles are capable of shooting one hole groups at 100 yards and not all applications require it. But, once a reloader with a chronograph identifies the velocities his arm prefers, much of the guesswork in working up loads can be eliminated and a wider range of components can provide acceptable results. The active ingredient in good copper removal solutions is ammonia. If you can't smell ammonia, it probably does not remove copper from a bore. Here's a home made solution from Mark Humphreville that is reported to work better than many commercial products. It clings well and shows good color indication just like Sweets but a fraction of the cost. Mix well and use on a wet patch or nylon brush. Here's an interesting set of recipes for making your own chamber casting material. The first recipe is an old traditional armory formula for making casts with Sulfur. I believe the lampblack is simply to color the material and the Oil of Camphor may work as the release agent. Mix together then heat until it melts. Be careful not to over heat because sulfur will catch on fire and burn. Have something available to smoother a fire in the container should it catch fire. This is reported to work quite well but of course the Sulfur cast will not be as durable as one made from a low melting point metal alloy. Here's the contents of a low melting point metal alloy similar to Cerrosafe (available from Brownells). I assume the percentage is by weight. Melt and mix together and you will have an alloy that melts at 160 degrees. Use as you would Cerrosafe. Most new reloaders create extra work for themselves by using standard production dies consisting of a full length resizing die and seating die. Brass only needs to be full length resized if it has been used enough that it is hard to chamber or if the load will be shot in different firearms. If you only have one rifle that uses a particular caliber you can save work by neck sizing the brass. Full length resizing stretches and work hardens brass unnecessarily so you get fewer uses before the brass needs to be trimmed or annealed to prevent neck cracking. We are not fans of most of Lee products, but the Lee's collet neck sizing dies perform as advertised. Inexpensive conventional neck dies often produce a couple thousandths neck run-out. Competition bushing style neck dies are more expensive and require uniform neck thickness to produce consistent results. I have loaded thousands of rounds with a Lee Collet Neck Sizing die, and all are absolutely perfect, with no run-out what-so-ever. Because of the design, these dies produce identical holes for the bullet. They also do not have a button on the decapping pin so case stretching is minimal. And perhaps best of all, you don't have to lube the cases! If you are a high volume reloader, shoot fire formed brass, hate lubing necks, or use a progressive press then try the Lee collet neck die. Lee had discontinued but is again offering undersized arbors for their collet dies so you can even adjust neck tension! Changing the pin is a snap and much easier then swaping donuts in a competition die. There is only one thing the Lee Collet Neck dies do not do. You cannot set it to resize only part of the neck as you can with a competition dies. I am not certain this is important for most shooters who are adequately seating the bullet well into the neck. Short of this one minor limitation, and given the cost of these dies, they are indeed a great value. Dummy rounds loaded with the different bullets you shoot is the easiest way to set seating dies or measure throat wear. Simply seat a bullet in a fire formed and neck sized case so it touches the rifling lands. Contact on the lands is normally confirmed by using a candle to deposit soot on the bullet. When the bullet is carefully chambered you should see clear land contact marks through the soot. This can be accomplished by trial and error or by using one of our favorite tools, the Sinclair overall length gage. Once you have a dummy round that just touches the lands adjusting seating dies is as simple as placing the dummy round in the press, lowering the handle and screwing the die stem down until it makes contact. If you also take the time to measure the thread pitch (number of threads per inch) on the die seating stem you can make it much easier to adjust the die for a desired distance "off the lands". Many dies use an 18 thread pitch on the stem. That means it will take 18 full turns to move the stem 1 inch, 1 full turn will move the stem .0556", 1/2 turn .0278", 1/4 turn .0139" and 1/8 turn will seat the bullet .0069 inches off the lands. Even if you have competition dies with calibration marks to a thousandth it will be much easier to adjust the die for different bullets if you use dummy loads. And, at any time you can conduct a quick check of throat erosion by simply chambering a dummy round sooted with lamp black to confirm it is still contacting the lands.